The little community and the creek, that was discovered and named by Samuel Horton. 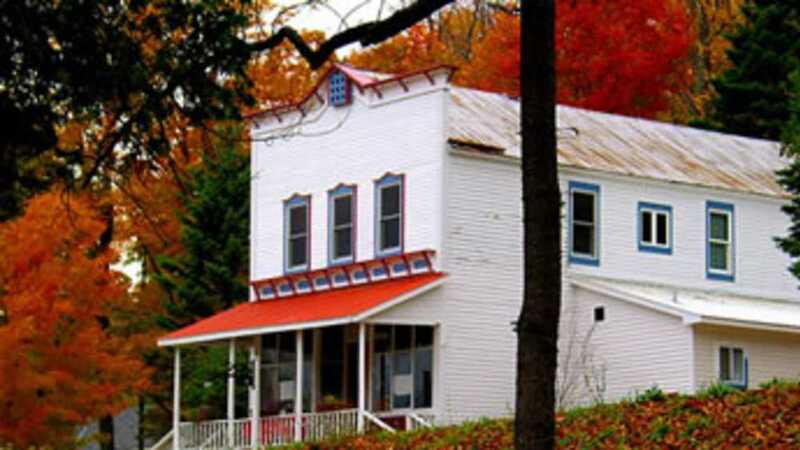 The Horton's Bay General Store is 126 years old having begun it's life in 1876. No doubt the Store's most famous frequent visitor was Ernest Hemingway who spent his youth and summers in this quaint little place on Lake Charlevoix, which was named Pine Lake back then. Tucked away on the shelves are tidy little jars of unique food items that, once you try them, they will become an obsession, according to Claudia. There is brightly colored ceramic pottery, made one at a time, by local artists and one of a kind clothing that all are presented perfectly together in unobtrusive places. There are gourmet meats, seafood and cheeses and breads which are also in the Market in Boyne City. Keep this page among your "Favorites" because there are new things coming such as the soda fountain, a virtual tour of the store and surroundings, as well as a Victorian Christmas with Sleigh Rides when Winter keeps its snowy promise. Next door is The Red Fox Inn which was in the 1919 a restaurant famous for its family-style chicken dinner now a bookstore that specializes in Hemingway titles, literatures and memorabilia. Also enjoy a history tour.